Woodstock is a 1970 documentary film of the watershed counterculture Woodstock Festival which took place in August 1969 near Bethel, New York. Entertainment Weekly called this film the benchmark of concert movies and one of the most entertaining documentaries ever made. The film was directed by Michael Wadleigh. Seven editors are credited, including Thelma Schoonmaker, Martin Scorsese, and Wadleigh. Woodstock was a great commercial and critical success. It received the Academy Award for Best Documentary Feature. Schoonmaker was nominated for the Academy Award for Best Film Editing, a rare distinction for a documentary. Dan Wallin and L. A. Johnson were nominated for the Academy Award for Best Sound. The film was screened at the 1970 Cannes Film Festival, but was not entered into the main competition. The 1970 theatrical release of the film ran 185 minutes. A director's cut spanning 224 minutes was released in 1994. Both cuts take liberties with the timeline of the festival. However, the opening and closing acts are the same in the film as they appeared on stage; Richie Havens opens the show and Jimi Hendrix closes it. Jimi Hendrix at Woodstock was also released separately on DVD and Blu-ray. In 1996, Woodstock was selected for preservation in the United States National Film Registry by the Library of Congress as being "culturally, historically, or aesthetically significant". An expanded 40th Anniversary Edition of Woodstock, released on June 9, 2009 in Blu-ray and DVD formats, features additional performances not before seen in the film, and also includes lengthened versions of existing performances featuring Creedence Clearwater Revival and others. 1. * Crosby, Stills & Nash "Long Time Gone"
3. * Crosby, Stills & Nash "Wooden Ships"
9. The Who "We're Not Gonna Take It" / "See Me, Feel Me"
13. Audience "Crowd Rain Chant"
16. Crosby, Stills & Nash "Suite: Judy Blue Eyes"
Woodstock received universal acclaim from newspaper and magazine critics in 1970. It was also an enormous box office smash. The edition of May 20, 1970 of Variety reported it was doing well in its third week in Chicago and San Francisco. (The trade paper used the insider term "lap" to mean "week" in the headline that cited Woodstock's $52,000 profit in Chicago.) In each of those metropolitan areas the movie played at only one cinema during that week, but many thousands showed up. Eventually, after it branched out to more cinemas including more than one per metropolitan area, it grossed $50 million in the United States. The budget for its production was just $600,000, making it not only the sixth highest-grossing film of 1970 but one of the most profitable movies of that year as well. Decades after its initial release, the film earned a 100% "Fresh" rating on the review aggregate website Rotten Tomatoes. Roger Ebert added Woodstock to his "Great Movies" list in 2005. Upon the festival's 25th anniversary, in 1994, a director's cut of the film — subtitled 3 Days of Peace & Music — was released in cinemas and later on DVD. It added over 40 minutes and included additional performances by Canned Heat, Jefferson Airplane and Janis Joplin. Jimi Hendrix's set at the end of the film was also extended with two additional numbers. Some of the crowd scenes in the original film were replaced by previously unseen footage. On June 9, 2009 a 40th-anniversary edition was released in two-disc sets on Blu-ray and DVD, available as both a "Special Edition" and an "Ultimate Collector's Edition". The latter included copious memorabilia. The director's cut was newly remastered in high definition with a 2K scan of the original elements, and provided a new 5.1 audio mix. Among the special features are 18 never-before-seen performances from artists such as Joan Baez, Country Joe McDonald, Santana, The Who, Jefferson Airplane, Canned Heat and Joe Cocker; five of the artists included—Paul Butterfield, Creedence Clearwater Revival, The Grateful Dead, Johnny Winter and Mountain—played at Woodstock but had never appeared in any film version. In the science fiction thriller The Omega Man (1971), Colonel Robert Neville (played by Charlton Heston) is seen traveling to a movie theatre in Los Angeles to screen the film for himself alone. Woodstock had been a recent film debuting prior to release of The Omega Man, and had been held over (continuously run) in some theaters for months. Neville darkly remarks the film is so popular it was "held over for the third straight year". As he repeats some of the dialogue verbatim, it is clear that Neville has repeated the ritual many times during the two years that he has believed himself to be the last man alive on Earth. Referencing the ground breaking, never before made, nature of the film Neville wryly reverses it to "they don't make films like that any more", a platitude common because of a new style of films emerging at the time. ^ "Woodstock (X)". British Board of Film Classification. May 7, 1970. Retrieved January 6, 2017. 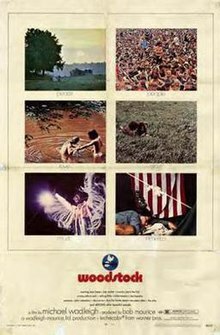 ^ a b "Woodstock, Worldwide Box Office". Worldwide Box Office. Retrieved January 9, 2012. ^ The Entertainment Weekly Guide to the Greatest Movies Ever Made. New York: Warner Books. 1996. p. 130. ^ Dunks, Glenn (December 6, 2014). "Team FYC: Citizenfour for Editing". The Film Experience. ^ "The 43rd Academy Awards (1971) Nominees and Winners". oscars.org. Retrieved August 27, 2011. ^ "NY Times: Woodstock". NY Times. Retrieved November 11, 2008. ^ "Festival de Cannes: Woodstock". festival-cannes.com. Retrieved April 11, 2009. ^ a b "Woodstock 40th Anniversary Ultimate Collector's Edition Import: Amazon.ca: Joan Baez, Richie Havens, Roger Daltrey, Joe Cocker, Country Joe McDonald, Arlo Guthrie, Jimi Hendrix, Carlos Santana, Janis Joplin, The Who, Sha-Na-Na, Country Joe and the Fish, Al Wertheimer, David Myers, Don Lenzer, Malcolm Hart, Michael Margetts, Michael Wadleigh, Bob Maurice, Dale Bell: DVD". ^ a b c "Here is proof that many thousands of... - Susanna Radaelli - Facebook". ^ "Woodstock, Movie Reviews". Rotten Tomatoes. Retrieved January 9, 2012. ^ a b "Woodstock: 3 Days of Peace & Music Blu-ray Review". Blu-ray.com. July 29, 2014. Retrieved August 18, 2017. ^ "DVD Review: Release 'revisits' Woodstock's 40th anniversary - LA Times". Glendalenewspress.com. August 15, 2014. Retrieved December 11, 2015. Kato, M. T. (2007). From Kung Fu to Hip Hop: Globalization, Revolution, and Popular Culture. SUNY Press. ISBN 0-7914-6991-3. Cf. pp.82-onward & various. Saunders, Dave (2007). Direct Cinema: Observational Documentary and the Politics of the Sixties. London: Wallflower Press. ISBN 1-905674-16-3. Bell, Dale, ed. (1999). Woodstock An Inside Look at the Movie that Shook Up the World and Defined a Generation. Studio City: Michael Wiese Productions. ISBN 0-941188-71-X. This page was last edited on 13 January 2019, at 16:40 (UTC).